Find your Retirement Home in a Great Gated Community! Solera Chandler homes for sale are low in inventory, but you can still find a great home in a gated community with resort amenities. But, hurry before the inventory falls off for the summer months. 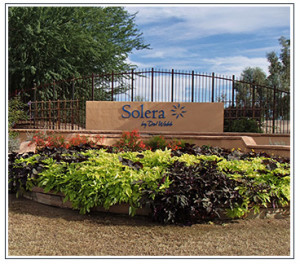 Solera is a Dell Webb community located in the Southeast Valley near Riggs and Gilbert Roads. Situated 30 miles southeast of Phoenix and is set amidst the gorgeous San Tan Mountains. With just 1,149 homes, Solera Chandler is smaller than other surrounding active adult retirement communities and residents enjoy an intimate friendly environment. When you buy a home in Solera, you are buying a lifestyle. The community features lovely single family homes and world class amenities. Lone Tree is an 18-hole golf course that winds through the community. This semi-private course is a traditional style designed by Darryl Wilson. Enjoy a practice facility, nicely stocked Pro Shop and The Grille will be your perfect 19th hole! Plus, you will have access to a state of the art fitness facility, two outdoor pools, hobby studios, computer lab and a library. Play tennis on one of the six courts or bocce ball and just hop on the walking path for a brisk walk or short stroll. Solera Chandler homes for sale are in great demand with this resort lifestyle. So don’t delay! Find all Solera Chandler Homes for Sale and contact us here or call 480-440-0849.